Despite US support, the revolutionary has only succeeded in pushing like-minded opposition leaders far, far away. Ready To Join The Resistance? Sign up for Take Action Now and we’ll send you three actions every Tuesday. Roberto Lovato has just published a great investigative essay in Foreign Policy on Leopoldo López, the jailed darling of Venezuela’s opposition. López is celebrated in the US press as a cross between Gandhi and Martin Luther King Jr. He is handsome, like King, and, like Gandhi, occasionally shirtless. Newsweek blushes over López’s “twinkling chocolate-colored eyes and high cheekbones.” He is, apparently, a “revolutionary who has it all”: an “attractive and supportive wife, two children who get along with each other and impossibly adorable Labrador puppies.” Everything except a revolution. Drawing on WikiLeaked cables, Lovato reveals how López over the years has been handled by the US embassy in Caracas. (Roberto told me that 15 minutes after a colleague of his posted the FP article on social media, someone from the US embassy e-mailed and said, “You should really come to me when it comes to Venezuela.”) Despite this support, though, López remains a divisive figure within Venezuela, and Lovato’s piece helps explain why the opposition can’t get its act together, despite opportunities offered by serious economic problems and rampant corruption. A few years ago, not long after Hugo Chávez’s March 2013 death and the razor-thin election of Chávez’s successor, Nicolás Maduro, López was at the center of a middle-class putsch attempt, protests that resulted in numerous deaths. It was as if all the rich, white gentry from LA’s Beverly Park started building barricades and stringing steel wire from lamppost to lamppost to decapitate motorcycle taxi drivers (as what happened to Venezuelan Elvis Durán), with the US media reporting on events as if it were Selma 1965. López’s claim to lead the Venezuelan opposition rests on his insistence that he had nothing to do with the failed April 2002 coup against Chávez. But Lovato nicely shows this insistence to be a lie. Then mayor of a rich Caracas municipality, López was everywhere those April days, rallying crowds, appearing on TV. His “most controversial episode,” as Lovato describes it, was leading a crowd to surround the house where a Chávez minister was laying low, picking up a megaphone to charge the minister with murder: “Justice will be imposed,” López said. López’s anti-Chavistas beat the minister in the street and then kidnapped him. López, in other words, is a thug. Ted Cruz with a mob. After the 2002 coup was reversed, López was arrested for carrying out an illegal detention. But he was released when Chávez’s government issued a broad amnesty for those who tried to overthrow it. For years, Chavismo had been remarkably tolerant of its most extreme enemies, absorbing many opponents in what had been a flexible (albeit often corrupt and enriching) coalition. This had the effect of inculcating the idea among irreconcilables like López that they were absolutely immune, that there was no plot they could hatch, no attempt to lure sectors of the military to revolt, that wouldn’t be forgiven. Coming so close to winning has had a dangerously regressive effect on the opposition. It took the Venezuelan oligarchy and old political elites about seven years to finally, grudgingly accept the legitimacy of Hugo Chávez, and only after they nearly destroyed the country with paralyzing strikes, coup plots and other actions meant to destabilize and disrupt. 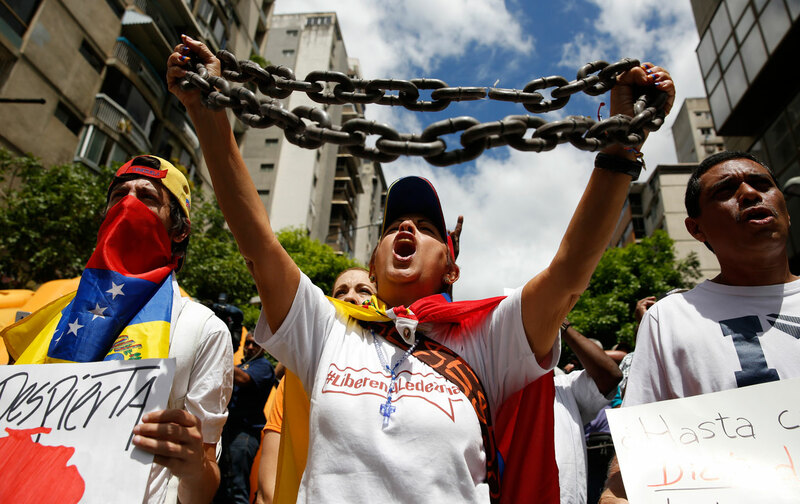 But now the opposition, giddy by its unexpectedly strong performance, sensing weakness on the part of Maduro, and believing the restoration of their class and race privilege is in sight, is once again hurtling toward the precipice…. In other words, we might be starting from day one, witnessing the beginning of a whole new cycle of polarization, in which the opposition returns to its maximalist program of antagonism. It’s too early to say how bad things will get, but already there are reports that on the Monday night after [opposition candidate] Capriles’ speech, his rampaging supporters left four Chavistas dead (you would never know it from reading Human Rights Watch’s coverage, but the primary victims of political violence in Venezuela over the last fourteen years have in fact been supporters of Chávez, including peasants trying to make good on land reform). In turn, Maduro, denied the time and stability to work on pressing matters of public administration, will be forced to respond, to take measures to try to once again socialize the oligarchy, its political agents and representatives in the media, measures which (however mild compared to, say, that catastrophe unfolding in Colombia or Honduras) will be denounced by Washington and its adjuncts like Human Rights Watch and the mainstream media. In the past, Chávez’s charisma, his light touch despite his often rhetorical bombast, his ability to bring some key opponents back into the fold, to make unexpected alliances, helped defuse social tension at key moments. It’s one of the reasons why Venezuela, despite an often excess of extreme rhetoric, didn’t spiral into the kind of violence often associated with other revolutions. Let’s hope Maduro can develop similar skills to set the agenda and not be provoked by the opposition’s provocations. Maduro didn’t, and López and his co-conspirators are in jail or in exile. The justice system is rigged against them (though no more so than the lack of due process faced by those accused of threatening the national security of the United States). But Lovato’s excellent reporting makes clear they are far from the democrats portrayed in the United States. Which explains why, despite supportive tweets from Kevin Spacey and Cher, some key opposition leaders in Venezuela are trying to distance themselves from López and move on. Greg GrandinTWITTERGreg Grandin teaches history at New York University and is the author, most recently, of Kissinger’s Shadow.